As I sat in the Riverbank Theatre awaiting the start of The Mousetrap, a play adapted from the Agatha Christie story, I heard a patron, actually an actor I recognized, say, “Everybody does this play…it seems to be somewhere every fall…but I’ve never seen it…strange.” I thought, how strange. It’s true, and I had never seen it either for some reason. If you are a fan of Agatha Christie, probably the most celebrated author of who-done-its of the last century, this production will likely be just the tasty theatre bon-bon you are looking for on a chilled fall weekend, a little chillier indeed at the theatre facing the St. Clair river. The setting is a British guesthouse recently inherited by Molly and Giles Ralston. The single-set design is the sitting room, complete with fireplace, sofa, chair, writing table, and stairs to the rooms. Kevin Fitzhenry’s set does a fine job of evoking an under-heated drawing room with a snowstorm outside. There are five guests due to check in. And we are informed by a radio report that a woman has been killed in London, and that the killer being sought wears a dark overcoat, light scarf and soft felt hat. Soon, we are introduced to the guests as they arrive. And we are led to believe by a cryptic call from the local constabulary to innkeeper Mollie Ralston that a Detective Sergeant is coming out to the house on a matter involving the case. Then, the audience is locked in on trying to guess who might be the guilty party. 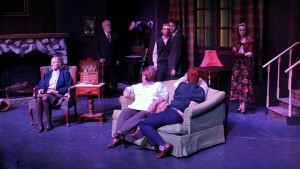 The possibilities include: Giles (Jordan Scott); the flamboyantly gay and somewhat menacing Christopher Wren (Bradley Hamilton); The serious, all-business Major Metcalf (Randolph Skotarczk); the butch necktie wearing Miss Casewell (Mandy Logsdon); and the mysterious foreigner (Frank B. Stevens). Connie Cowper as Mrs. Boyle doesn’t fit the profile of the killer at all. The suspense heightens when there is a murder at the guesthouse, complicating the puzzle. It is the second murder that reveals that, like other Christie yarns, the suspects, the apparent strangers, are actually tangentially connected like spokes to a wheel hub, the hub being the motive for the murders. The ensemble does a smooth job of moving the puzzle pieces around for the audience. Cowper does nicely as Mrs. Boyle, playing a prim, intolerant lady of a certain age who becomes the target of taunting by Hamilton’s Wren character and avoidance as she is just no damn fun–always too cold and always wants it quieter. Hamilton plays his young, manic, attention-deficit off-his meds almost a little too over-the-top at times, but it could be he is trying to make up for what at times feels like a lagging pace. I kept wanting to say “tempo! tempo!” to the cast. Logsdon is a steady presence in the play, a tad mischievous in her own right, but a welcome calm balance to the Wren character. As the center of the action, Maggie Alger’s Ralston is cool, confident and always positive about the decision to turn her inherited house into an inn. Her energy could be raised a notch or two, though, as so much of the action plays off of her. Tim Stone as Detective Sergeant Trotter sets a fine example for balancing on-stage energy for changing moods of the action. Another quibble. It is a British play set in a British inn. Director Kevin Fitzhenry rightly decided to have his players employ British accents. At times, a couple of the players let them down, drifting to non-accented dialogue. Part of keeping the action sharp, on target and cracking along, is making sure the accent and cadence of the British-speak stays on target. Bottom Line: All in all, a fine treatment of a Christie classic. And mind the final coda of the play, and do not tell your friends who done it after seeing it.